Project: Extension and refurbishment of a cottage (protected structure) in Rathfarnham, Dublin 14 Date: May 2011 to July 2012 Job Description: Design, planning permission, supervision of the works and certification. Our clients bought a 51 square metres bungalow in derelict condition. 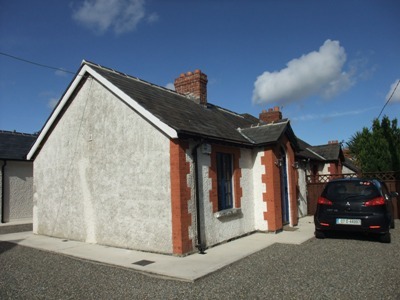 The semi-detached dwelling was built in the 1920's in Rathfarnham, Dublin 14. It is a working class cottage, which became a protected structure at the start of the century. A single storey extension built to the rear during the 1950's had to be demolished. Water infiltration through the roof caused extensive damage. Granite stones foundations were sinking in the soft ground creating structural cracks in the walls and the chimney. The clients were looking for an architect to design the refurbishment and an extension to the dwelling. The brief included for the provision of 2 double bedrooms, a large bathroom and an ensuite as well as decent living spaces. A detached domestic garage was also required. Working with the local authority and the clients we proposed a 40 square metres rear extension providing 2 bedrooms, an ensuite bathroom, a main bathroom and an entry hall. The entry to the original dwelling is located to the front, it was preserved as per requirements for the listed structure, but the project created another entry to the rear which now became the main access into the cottage. An internal wall separating the existing kitchen from a bedroom was demolished to provide a well sized dining / kitchen area. The dwelling was fully re-roofed and a felt was added. Existing roof slates were preserved to the front fa�ade as per requirements to protect the front of the dwelling which is listed for its architectural interest. The existing foundations were underpinned under the supervision of "David Jenkins Consulting Engineers". A 24 square metres garage was proposed and granted planning permission to the rear of the property. New windows and doors fitted within the cottage are timber frame double glazed casement windows, which are visually similar to the original windows fitted during the construction of the cottage approximately 90 years earlier. A general building contractor was appointed to carry out the refurbishment, to build the extension and the garage. 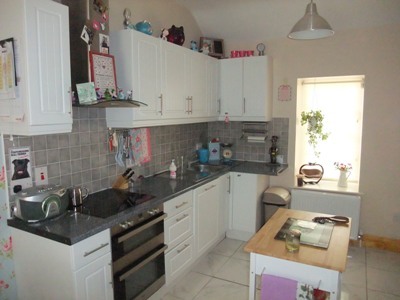 The clients carried out all painting and tiling works, as well as landscaping and decoration. Construction work started in September 2011. The contractor completed his works in February 2012. All painting, decoration and landscaping works were completed during the summer. The chimney had to be fully dismantled and re-built above a new foundation using the existing bricks and chimney pots and a lime mortar similar to the original mortar. The interior of the existing building was dry-lined and insulated to comply with elements U-Value of a new built. 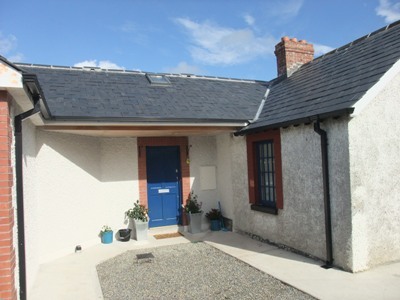 The dwelling obtained a B3 Building Energy Rating certificate at completion of the works. The property is equipped with a condensing gas boiler and with an underground retaining rain water tank designed by "Enviropro Ltd" to limit storm water flow to 1 litre per second as required per the Greater Dublin Code of Practice for Drainage Works.